From Ox-Yoke Originals. 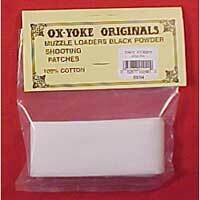 The famous Ox-Yoke material is a tight woven cotton, clean and ready to use, no pre-washing required. Cut in 1-1/2" strips to pre-cut your own patches or cut in place for each shot. Available in dry material only (not lubricated). Six (6) 1-1/2" x 36" strips per bag. Available in three sizes; .010" thick No. 330104, .015" thick No. 330154, or .020" thick No. 330204.